WWCT has been supporting research and surveys for the Critically Endangered forest antelope Aders’ duiker (Cephalophus adersi) since 2002. This beautiful antelope stands out amongst other duiker species with its distinctive markings and narrow distribution. Confined to East Africa’s coastal forests the species was, until recently, thought to be extinct everywhere except the island of Zanzibar and the Arabuko-Sokoke forest in Kenya. However a sighting in 2004 and a follow-up camera-trap survey in 2008 have confirmed a substantial population in the Boni-Dodori forests of northern coastal Kenya. This is great news for Aders’ duiker although the situation is far from secure as major infrastructure developments are planned for the area. A WWCT team working with Kenya Wildlife Service (KWS) in the Arabuko-Sokoke Forest National Reserve obtained the first camera-trap photos of Aders’ duiker in Kenya. However there was no evidence for the species in any other Kenyan forests until the sighting near the Dodori National Reserve in 2004. The security situation and poor accessibility prevents regular travel to the Boni-Dodori area but in 2008 WWCT helped support an expedition to the forests led by KWS and assisted by scientists from National Museums Kenya, WWCT and the Zoological Society of London (ZSL). 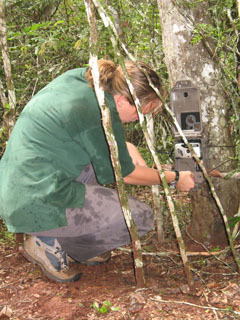 The successful documenting of Aders’ duiker and a host of other rare and threatened species has resulted in an ongoing programme of camera-trap surveys in Kenya’s coastal forests to document the tremendous biodiversity value of some previously poorly known areas. WWCT continues to provide technical assistance to this programme.